There are many factors to be considered when making this decision, and the answers are different for everyone, depending on your unique situation. The below are some things to consider when trying to make your decision. First and foremost, can you afford to keep your home and still purchase or rent another? For many people, this is the biggest factor to consider. If you are planning on purchasing another home, do you need to sell your existing home in order to use the equity as a down payment? Will you qualify for a mortgage on a second home? Maybe you’re not in a position where you’ll be purchasing another home. Even so, you still need to consider if the rent you’ll be receiving will cover the mortgage, upkeep, maintenance and various other costs of keeping the home as a rental. That being said, will renting your home out be profitable for you? Maybe your move is supposed to be temporary and you want to be able to come back to your home instead of starting over and buying new when you return. Or maybe you want to try to hold on to the house for sentimental reasons (perhaps it’s your family home) so you are considering trying your hand at being a landlord. Whatever the case may be, you need to make sure you’ll end up with a positive cash flow when all is said and done. Take the time to consider all the expenses in renting the home vs how much money you will be bringing in. These expenses include everything from the mortgage itself, to insurance, maintenance, management company fees, and administrative fees (such as advertising). Consult a real estate agent who specializes in rental properties and discuss the market for rentals in your area. He or she will go over the expenses you can expect with to incur with your property and help determine if this is the right choice for you. Are you in a position to manage the property yourself or will you hire a management company? While it costs money to hire a management company (approximately 10% of your rental income), you need to consider how much work goes into managing a rental and how taxing it can be, mentally and physically. A management company deals with the legal documents between you and your tenants, collects the monthly rent, screens tenants, handles evictions and schedules all maintenance, routine and unexpected. You also need to consider if you have the type of personality to separate yourself from your tenants. 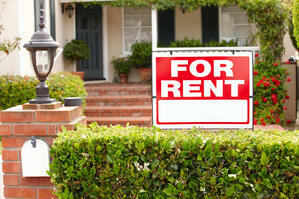 When you are renting your property out, it is a business transaction. If your tenant is consistently late with the rent, are you able to be firm with them? Demand payment or advise them you are starting the (long) eviction process even though young kids might live in the house and mom or dad just lost their job? If this isn’t something you think you can do, even though it means you’re losing out on your income, hiring a management company is detrimental. What condition is your home in? Are there repairs or upgrades that need to be done in order to make the most from a sale, but you don’t have the extra money to invest right now? If this is the case, perhaps renting it for a period of time while you save to make the improvements is a wise choice… only if you are able to stay afloat in the meantime. What is the real estate market predicted to do in the next couple of years? If you are holding onto the home as a rental temporarily but plan on selling down the road, you might find yourself in a position where the market drops and you end up losing money at the time you sell. On the flip side, maybe the real estate market is expected to boom in the next few years. Holding onto the home just might end up being a very wise decision if you’re able to sell during a “sellers’ market”. Again, you need to determine your expenses vs income before making this decision so as not to make a decision you’ll quickly regret. This is another scenario in which you might want to consult a real estate agent for insight. What is your tax situation? Along with making an appointment with a real estate agent who specializes in rentals, you might also want to make an appointment with a tax advisor. There may be a number of tax benefits to take advantage of when renting, such as capital gains taxes, but to make sure you are getting the most up to date information, take the time and speak to a professional. Putting the time in now for legal, real estate and tax advice might save you money and disappointment down the line. Whatever your reason for leaving your home, your due diligence in seeking advice and thinking long and hard about the above questions/scenarios will help to make this important life decision. There are advantages and disadvantages to selling and renting and only you can determine what makes sense for your situation, financially and emotionally.